Halloween may usher in a chill in many parts of the USA but in Myrtle Beach, with temperatures still balmy, golfers are happily driving onto fairways and fist-pumping as they hear the clink of their putt dropping decisively into the hole. What a great time to visit the Golf Capital of the World! The Mystical Golf Writer's Tournament was in full swing once again this past week at The Witch, Wizard and Man O' War courses; in it's fifth year of operation, sports and travel writers converge upon Myrtle Beach to play these unique courses which are different yet which share a common bond. In spite of the wrath which Hurricane Joaquin laid in its path, these three gems were unaffected and remain in very nice condition, ready to cast their magical spell upon tourists and locals alike. In previous articles about The Witch, Wizard and Man O' War golf courses, I gave an overview of each course, from the enclosed and "macabre" feeling you get driving on the creeky paths of the Witch to the breathtaking feeling of the Man O' War, where many holes are surrounded by water, where the wind can be your friend or not and where island greens test your resolve. Bob Gillespie ready to putt on hole 9 at Man O War. Claude Pardue watches as Barry tends the pin. The Wizard designed to be a links-style course, is as challenging as its sister courses but also offered scoring opportunities (especially from the forward tees, which is where the ladies played from during the tournament). One big tip I can offer about all of the Mystical golf courses is, if you want to make a green in regulation, you must place your tee shot properly. These golf courses are built for shot makers - you can't just bomb away and wherever your ball lands you'll get onto the green - touch and thought is the name of the game. The three Mystical golf courses are designed by Dan Maples, who has designed over thirty courses to date around the world and whose family has been involved in the business of golf since the late 1800's so now you know that, when you play a Maples course, your skills will be tested. 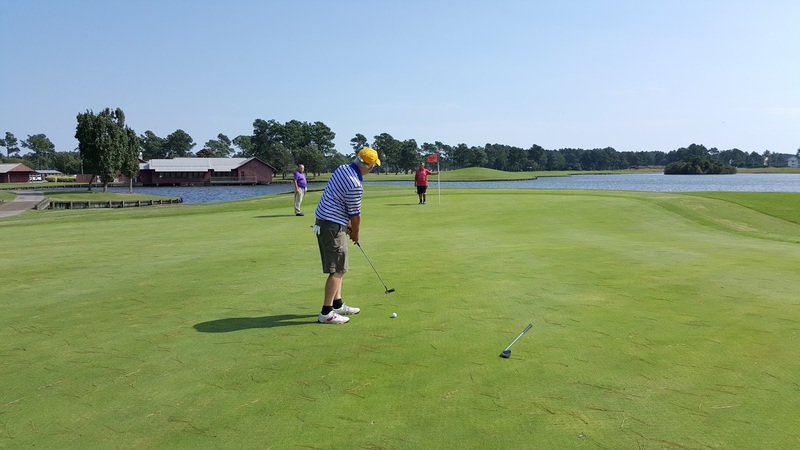 A Myrtle Beach golf vacation would not be complete without the ability to choose from sixty miles of accommodations and from over a thousand restaurants. This year, our group was treated to a stay at The Breakers, one of my favorite hotels from when we used to travel here for vacation. Upscale and with awesome views, this hotel is located in a prime position, only a few blocks from the 1.2 mile Boardwalk (named by Budget Travel as one of the country's most awesome boardwalks) and a two-minute drive to Broadway at the Beach. As for the food, tournament participants were treated to dinner at Wild Wing Cafe and then, arguably, to the top show in Myrtle Beach, "One" The Show at the Alabama Theater in Barefoot Landing. We had been to both venues several years ago at a previous Mystical Golf Writers' Tournament and were happily surprised to be going once again. For Myrtle Beach vacationers and locals alike, "One" The Show is entertaining, patriotic and shows off great talent such as "Star Search" male vocalist and emcee, Greg Rowles, Grant Turner (aka the hilarious Ricky Mokel) and Irving the Dog from America's Got Talent. 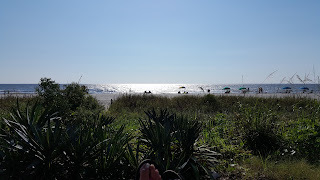 Myrtle Beach...The Grand Strand...has seven of the "Top 100 Public Golf Courses in America" by Golf Digest and was ranked number one in 2014 on TripAdvisor's top summer destinations. 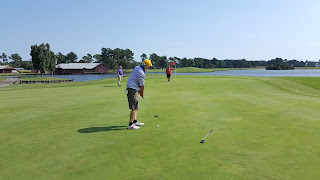 If you are looking for a golf vacation that fills your senses ...and your tummy... without taking a bite out of your wallet, which gives you an extensive choice of cushioned fairways and tricky greens, Myrtle Beach is the vacation spot for you and your family. For more information about The Witch, Man-0-War and The Wizard, please visit www.mysticalgolf.com, or call 843.282.2977. 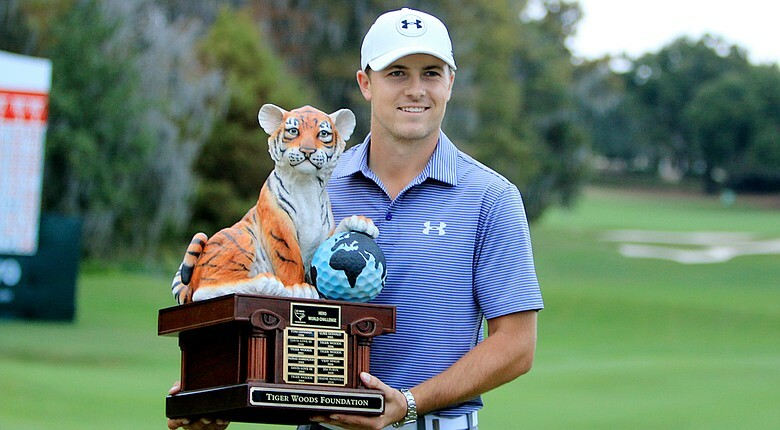 Golf fans excitedly watched this season as Jordan Spieth decisively climbed the PGA Tour ranks to become number-one atop the world rankings and, although fans think this is a wow factor, there are other tours and players who are out there grinding it out but rarely receive much attention. Have you ever followed the Web.com or Challenge Tour? 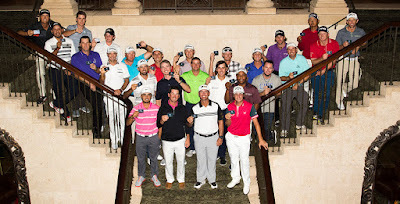 Recently, fifty players on the Web.com Tour graduated to the PGA Tour and became card-carrying members with a chance of, one-day, winning events, getting more recognition and, perhaps, a few big-name sponsors. Some golfers' names are recognizable and others are just getting their start but one thing is for sure...dreams are alive on every Tour! Meet the fifty Web.com winners who earned a spot on the PGA Tour. 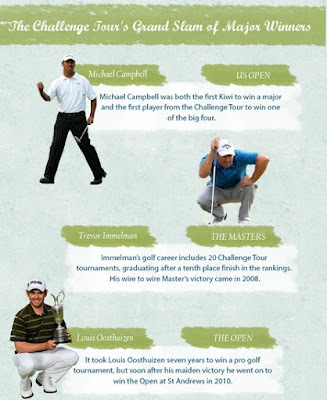 The Challenge Tour is the European Tour's answer to the Web.com Tour and has produced such recognizable names as Martin Kaymer and Louis Oosthuizen. The Challenge Tour is now featuring a "Road to Oman" Challenge ranking system - if you are a golf fan, you will know that a recent winner is a first from Italy, Matteo Delpodio. Although fans can't possibly watch every tournament, it's interesting to follow along with lesser known tours like the Web.com or Challenge Tour. Keeping an eye on the rankings makes you feel closer to the struggles of golfers as they attempt to rise through the ranks and into the spotlight. The "feel" of each of these Tours is quite different and offer a look into venues and countries that inspire the average golfer to improve while understanding that, in golf, we're always learning! Do you follow the Challenge or Web.com Tour? Let us know on Twitter @Golf4Beginners or on our golf blog. "Tiger Woods changed the Game, Spieth plays it." 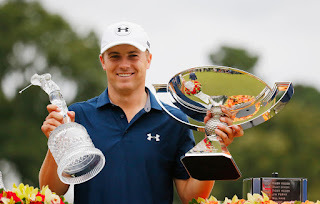 Golf fans desperately searching for the next Tiger Woods, here he is - Jordan Spieth! Or is he...? While one of the greatest golfers to have ever played the game is now ruminating that the 'sun is setting on his career', the other, Spieth, is eagerly contemplating his future. At twenty-two years old, Spieth is not only a multi-millionaire, but he's also already a record breaker, earning more than Tiger Woods in one season. Jordan has now regained the title of number-one golfer in the world, he's won two majors in one season (The Masters and the U.S. Open) and almost clinched the remaining major tournaments. 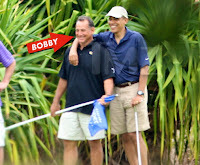 He is also the youngest golfer to win five events in one season. But, is Jordan Spieth ever going to topple the legacy of the former World's Number One? There are so many Tiger Woods devotees on social media that, after reading through some of the comments on the "Golf Nothing More" group to which I post, I have to say that it will take a major shift in mindset as much as very hard work from the young Spieth to change the hearts and minds of fans. The question on the group page was, "Is Spieth a Better Golfer at Twenty-Two than Tiger Woods?" David White, "Tiger never missed any cuts." which speaks to Woods' incredible golf ability at such a young age. Steve Wesson, "Tiger changed the game - Spieth plays it. I love them both but I would take a young Woods over Spieth." Tiger Woods did change golf and introduced the game to a whole new era of people that wouldn't know a hybrid from a wood. He got kids involved in the game just by being so far above the rest that people tuned in just to see him perform...and he was GOOD...the BEST that had played in a very long time. I would have to agree that, at twenty-two, Tiger Woods still had the upper hand versus the young Spieth but, at the rate of growth of the current World's Number One Golfer, does Spieth have a chance to, one day, have his name on the lips of golf fans as the one who surpassed Tiger Woods' records? Looking forward to a new year, the next question might be, "How is Jordan Spieth going to top his award-winning season in 2016?" Spieth would have to win, at the very least, the other two majors that he closed in on this past year - The British Open and the PGA Championship - in order to have the elusive Grand Slam in his back pocket. He would have to win several larger tournaments that include a top-name field and do it easily, as Tiger Woods usually did in pressure-cooker situations. We cannot predict the future nor can we write Tiger Woods out of the history books yet, but, as Jim Nantz mentioned during coverage of the Masters, "Win or lose, you just got a good look at a young man who’s going to be a big part of the future of this sport". Isn't that Tiger Woods' trophy? Join in the conversation on Twitter @Golf4Beginners and comment on this Golf for Beginners blog.